Heatstroke is the leading cause of non-crash, vehicle-related deaths for children. Every 8 days a child dies from heatstroke in a vehicle, on average, according to Safe Kids Worldwide. 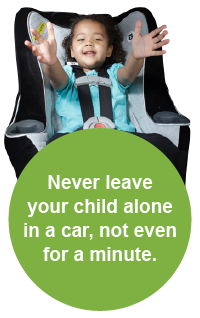 While it's tempting to leave your child in your car while you run in to the bank, post office, or store for a quick errand, instead of dealing with car seats and boosters, remember that leaving a child alone in a car can lead to serious injury or death in a matter of minutes as young children's bodies can heat up 3 - 5 times faster than an adult's. Safe Kids Worldwide recommends remembering to ACT. A - Avoid heatstroke-related injury or death by never leaving your child alone in a vehicle and remembering to keep your car locked so children don't get in on their own. C - Create reminders by putting something in the back of your car, next to your child, such as a briefcase, purse, or cell phone. T - Take action - if you see a child alone in a car, call 911. Your call could save a life.